It is fair to say that most of us are familiar with metal. It’s all around us, significant amounts of the earth are made up of iron and aluminum, and we even need metals in our bodies to function properly. But how much do you know about the metal fabrication and welding industry? From metal bending and sheet metal working to laser cutting metal and robotic welding, there has been a lot of change in the industry over the years and sometimes it can be hard to fathom just how important and impressive this industry is. 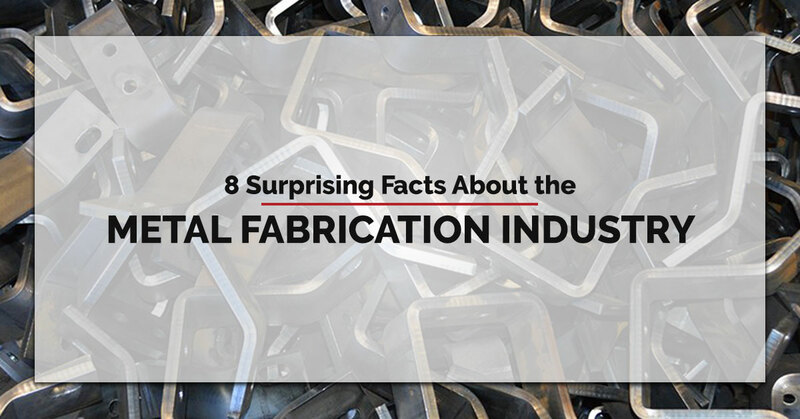 As your local metal fabrication shop, we may be a little biased and over-passionate about this topic, but that doesn’t mean we don’t want to share a bit of knowledge with the world! Honestly, once you know these surprising facts about the welding and metal fabrication industry, we can’t imagine you won’t be excited too. LEt’s get to it. Over half of all products in the US are the result of some sort of metal fabrication. A few examples include chairs, cars, planes, boats, bridges, and even laptops and phones. The first evidence of primitive welding was from the Bronze Age – a period of time from about 3000-1200 BC when people began to use bronze metal. This type of welding was technically forging, where two pieces of metal would be held in a fire until they glowed red, and then would be hammered together on an anvil. This led the way for new ways to bond metal and the inventions that could come from it. While today welding is one of the main ways to manufacture buildings and structures for ultimate security, that wasn’t always the case. One of the most famous examples is the Sydney Harbor Bridge in Australia, the world’s largest steel arch bridge. The bridge is over three-quarters of a mile long, and sits 160 feet above the water. When construction started in 1923, welding was still in its infancy and engineers were unsure about supporting a bridge through welded metal. To this day, the bridge is still held together by over six million steel rivets. The first industrial robot, the Unimate, was installed in 1961 by General Motors. The motorized arm weighed more than two tons, and the machine performed spot welds based on step-by-step commands delivered through a magnetic drum. The robot cost $65,000 to build, but was sold to GM for only $18,000. However, GM soon installed 66 of these robots and was able to produce 110 cars per hour. The first Unimate robotic welder was eventually inducted into the Robot Hall Of Fame. Steel is one of the most important metals on earth. Steel is the most-used framing material for buildings all over the world. This is because it has the highest strength-to-weight ratio of all construction materials and is one of the safest options. This makes steel the third largest industry, beat out only by oil and gas. Additionally, steel is nearly 1,000 times stronger than pure iron, and can be recycled without losing strength. In fact, nearly 70% of all steel in North America is recycled each year – which is about 80 million tons. Steel is also the main metal used in delivering solar, hydro, and wind power. Your car undergoes hundreds of hours of welding, fabrication, and other metal work before it hits the road. A NASCAR racecar, in turn, has usually received almost a thousand hours of manual labor to ensure the safety of the driver and the performance of the vehicle, from the sheet metal forming to expert suspension to a reinforced roll cage. You can weld underwater – and we don’t mean in a dry chamber. Wet welding, also called hyperbaric welding, happens when a diver uses a waterproof electrode to deliver about 400 amps of direct current to the material being welded. So far, the deepest wet weld was performed at over 2,000 feet underwater. The average American welder is 54 years old, yet the welding and metal fabrication industry is still growing. This means that the metal fabrication and welding industry should grow significantly in coming years as welders reach retirement and new workers are needed. Along those lines, metal fabrication and welding have recently been deemed “green-collar jobs” because eco-friendly industries like mass transit, solar and wind power, and construction retrofitting all require skilled welders. Additionally, as we mentioned above, steel is incredibly recyclable. For example, a wood-framed house uses about 40 trees, yet a steel framed home only needs about 4 recycled cars to complete. At Fort Miller Fab3, we eat, sleep, and breathe metal fabrication. This makes us one of the premier turnkey metal fab shops in the North East. We do it all, from engineering and welding to laser cutting and painting. Contact us today about your project and let us know what we can do for you.